Dalai Lama is a Tibetan spiritual leader. Altan Khan, the Chinese prince of Ming dynasty, created the title of Dalai Lama. Dalai means Guru. Tenzin Gyatso is the current 14th Dalai Lama. Before Tenzin Gyatso there are 13 Dalai Lamas. Gendun Drup was 1st Dalai Lama, Gendun Gyatso was 2nd Dalai Lama, Sonam Gyatso was 3rd, Yonten Gyatso was 4th, Ngawang Lobsang Gyatso was 5th,Tsangyang Gyatso was 6th, Kelzang Gyatso was 7th, Jamphel Gyatso was 8th,Lungtok Gyatso was 9th, Tsultrim Gyatso was 10th,Khendrup Gyatso was 11th, Trinley Gyatso was 12th and Thubten Gyatso was 13th Dalai Lama. Dalai Lamas are monks of the Gelug or “yellow Hat” of Tibetan Buddhism. Je Tsongkhapa founded the schools of Tibetan Buddhism. Since the time of fifth Dalai Lama, the Gelug tradition has been conferring significance to the personality with the status of Dalai Lama. How is Dalai Lama chosen? Tibetan government finds the next Dalai Lama following the death of current Dalai Lama. The process of finding Dalai Lama can take a long time. It took four years to find the current 14th Dalai Lama. When the previous Dalai Lama was being incinerated, High Lamas had to trail the direction of the funeral smoke which is believed to lead to the location of next baby successor who is fit to take on the spiritual leadership. They conduct a simple test. The previous Dalai Lama’s personal belongings are placed in front of the child residing in the locality indicated by the funeral smoke. If the paraphernalia of previous Dalai Lama are chosen by any child, the high Lamas will report their findings to eminent individuals and then to the government. If the belongings are chosen by more than one child, then monks and officials draw lots in a public ceremony for the selection of a single true successor. The child who was chosen successfully as the next Dalai Lama is taken along with his family to Lhasa and he will be made to undergo the lengthy process of studying for several years the Buddhist scriptures in order to take up the helm of spiritual leadership. The original name of Tenzin Gyatso is Lhamo Thondup who was born on 6 July 1935 in Takster, Tibet. He was selected as the tulku of the 13th Dalai Lama in 1937and in 1939; he was formally recognized as the 14th Dalai Lama at a public declaration near the town of Bumchen. On 22 February, 1940 his investiture ceremony to make him formally the next Dalai Lama was held in Lhasa. On November 17, 1950 at the age of 15, he assumed political powers as Dalai Lama. Dalai Lama left Tibet and took resort in Dharamsala in northern India during Tibetan uprising. Dalai Lama has travelled the world and spoken about the welfare of Tibetans, non-violence, Buddhism, interfaith dialogue, women rights, physical sciences, cognitive neuroscience, economics, environment, reproductive health, along with various topics of Mahayana and Vajrayana in Buddhist teachings and he wrote many books on Buddhism. Tenzin Gyatso won the Nobel Prize for peace in 1989. 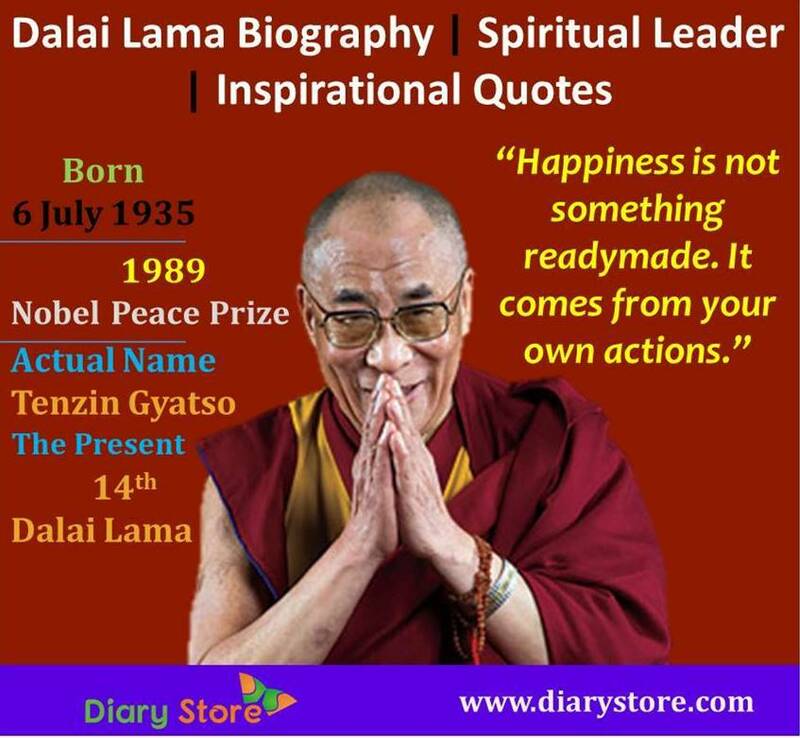 Tenzin Gyatso was born on 6 July 1935 in a farming family. The family belonged to Monguor ethnic group in China. Lhama Thondup was one of seven siblings to survive childhood. Three teams were sent in search of a small boy who would be the new incarnation or 14th Dalai Lama. One team went in the direction of north-east, another team in the east and the third in the south-east following the path of smoke. Guided by the smoke, the searching team arrived the village Takster. The team conducted tests to select the young successor. The tests consisted of placing before the new incumbent the objects belonging to 13th Dalai Lama and also those belonging to others. Lhama Thondup selected exclusively the paraphernalia of 13th Dalai Lama, rejecting the belongings pertaining to others. Finally, Panchen Lama, the selector chose Lama Thondup as the 14th Dalai Lama and he was later renamed as Tenzin Gyatso. Finally, Tenzin Gyatso was picked up for the investiture ceremony. At the age of six Dalai Lama Holiness began his monastic education. The courses derived from the Nalanda tradition, consisted five major and minor subjects. The major subjects included fine arts, logic, Sanskrit grammar and medicine, but the great prominence was given to Buddhist philosophy which was further divided into five categories such as Prajnaparamita, Madhyamika, Vinaya, Abidharma and Pramana in addition to epistemology and logic. The five minor subjects included drama, poetry, astrology, synonyms and composition. In 1959, at the age of 23, during the annual Great prayer Festival His Holiness sat for his final examination in Lhasa’s Jokhang Temple. He passed with honors and was awarded the Geshe Lharampa degree, equivalent to the highest doctorate in Buddhist Philosophy. In 1950, after China’s occupation of Tibet, Dalai Lama Holiness was called upon to assume full political power. He went to Beijing and met Mao Zedong, Deng Xiaoping and Chou Enlai and other Chinese leaders in 1954. The Tibetan national upheaval erupted in 1959 opposing the brutal suppression by the Chinese troops in Lhasa. Dalai Lama escaped into exile. Since then he has been living in Dharamsala, in northern India. He set up the government of Tibet in exile in Dharamshala which is often referred as “Little Lhasa”. Dalai Lama created a Tibetan educational system in order to teach the Tibetan children the Tibetan language, religion, history and culture. In 1959, the Tibetan Institute of Performing Arts was established and later the Central Institute of Higher Tibetan studies became the primary university for Tibetans in India in 1967. Dalai Lama appealed for the rights of Tibetans to the United Nations. As a result, much before the People’s Republic was allowed representation at the United Nations, the General Assembly adopted three resolutions on Tibet in 1959, 1961 and 1965. China was required to respect the human rights of Tibetans, as stipulated in the resolutions. He opened in 1970 the Library of Tibetan Works and Archives in Dharamshala which houses over 80,000 manuscripts and important knowledge resources related to Tibetan history, culture and politics. In 2016, he was awarded Bharat Ratna for His Holiness by the Indian Government. Earnest negotiations on the future status of Tibet and on the relations between the Tibetan and Chinese people should be commenced. The Dalai Lama retired from the Central Tibetan Administration on 29 may 2011. The Dalai Lama issued the following statement concerning his reincarnation, On 24 September 2011: Dalai Lama said when he would become ninety year old, in order to re-evaluate whether the institution of Dalai Lama should continue or not, he would consult the High Lamas of the Tibetan Buddhist traditions, the Tibetan public and other concerned people who follow Tibetan Buddhism. If the decision is taken that the selection process for fifteenth Dalai Lama should continue, the responsibility for doing so will basically lie on the concerned officials of the Dalai Lama’s Gaden Phodrang Trust who should seek advice and direction from the reliable oath–bound Dharma protectors who are linked inseparably to the lineage of the Dalai Lamas and no recognition or acceptance should be given to a candidate chosen for political ends by anyone including those in People’s Republic of China. Dalai Lama received the Ramon Magsaysay Award for community Leadership in 1959. Dalai Lama was awarded the Dr. Leopold Lucas prize of the University of Tubingen by Professor Hans-Jurgen Hermisson on 16 June 1988. In 1989, Dalai Lama received Nobel peace prize for “the struggle of the liberation of Tibet and the efforts for a peaceful resolution” and “in part a tribute to the memory of Mahatma Gandhi”. Dalai Lama received the freedom Medal from the Roosevelt Institute in 1994. He received the Christmas Humphreys Award from the Buddhist Society in the United Kingdom on 28 May 2005. Dalai Lama recognized with Honorary Citizenship by the Governor General of Canada on 22 June 2006. The Dalai Lama was named presidential distinguished professor at Emory University in Atlanta in February 2007. He received the Congressional gold Medal by American lawmakers on 2007. This is the highest civilian award. He was awarded the Templeton Prize in 2012.